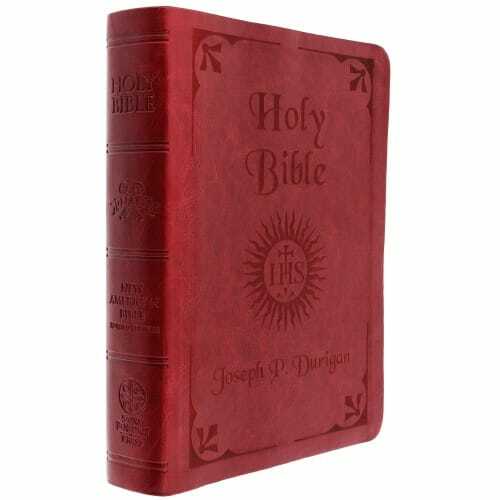 An exclusive design of the Catholic Company, this personalized IHS Bible features a stunning insignia that incorporates the Holy Name of Jesus as it was written in the Gospels. It is the first three letters of the Greek Spelling of the Holy Name of Jesus. The name “Jesus”, in Greek, is translated “ihsous”. Personalized in an elegant, complementary font, this Bible will become a lifelong treasured heirloom for its recipient. Soft, leather-like cover with a satin ribbon tab. This is a great bible and has enough notes that it can be a study bible as well!